Whether you’re sat in your garden, attending a wedding, or off on your holidays, dressing for hot and humid weather can prove a challenge. And for many men, one of the most difficult aspects of summer fashion is still looking smart and gentlemanly while wearing relaxed, lightweight and cool clothing. What is the coolest fabric to wear in summer? What colours should you wear in summer? When the weather is warm and sticky, the last thing you want is to be dressed head to toe in non-breathable fabrics that will make you overheat. Thankfully there are plenty of lightweight fabrics for summer that will help you wick moisture away from the body and keep you looking and feeling great no matter how high the temperature rises. When you’re trying to stay cool in the heat, it’s always best to opt for natural, lightweight fibres. These will absorb any moisture quickly, and as they have a thinner composition, they will feel more breathable against your body. Opting for 100% cotton is a great way of beating the heat and staying stylish at the same time. There are many different types of cotton, but instead of going for thicker types, we advise you go for lighter versions like seersucker and poplin. Cotton is also a good option if you have sensitive skin as it’s hypoallergenic and so won’t aggravate your skin or cause reactions. 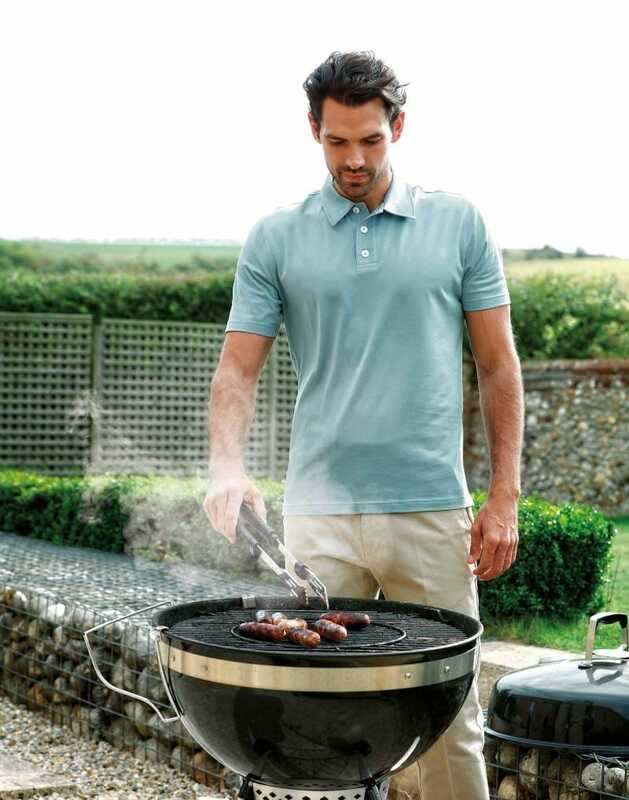 As many manufacturers recognise the benefits of this material, it also means that cotton clothing is available in an endless variety of colours and patterns, so you’re sure to be able to find the perfect options for your warm weather wardrobe when you shop for this specific summer fabric. Linen is an extremely popular summer fabric choice as its composition allows for more airflow, meaning it won’t cling to your skin when you’re already feeling hot in the sun. As it’s a stiff fabric, it will billow away from your body in the breeze and dry off quickly if it has absorbed any moisture or water. Linen also has a unique molecular structure that enables it to absorb up to one fifth of its weight in moisture before it starts to feel damp. Many men’s summer jackets and suits are made from this material which make them an ideal choice for weddings and formal events, as they help to keep the wearer comfortable and cool. Linen also has great conductivity characteristics that allow heat to escape quickly, meaning you’ll feel fresher for longer in your summer looks. So, if you’re off travelling to a hot country or you plan to spend your summer out in the garden, opting for linen will help you keep cool all day long. Denim is a staple in many men’s wardrobes, but as the material tends to be relatively heavy, it might be time to swap it for chambray fabrics during the summer. Chambray is a type of cotton that is often made up of a finer weave and more breathable fabric, and as it’s got a very similar appearance to denim, you can get the look without the added heat. As chambray is a particularly popular alternative to true denim, there are plenty of different washes to pick from, meaning you can achieve the exact aesthetic you were after in this summer fabric. 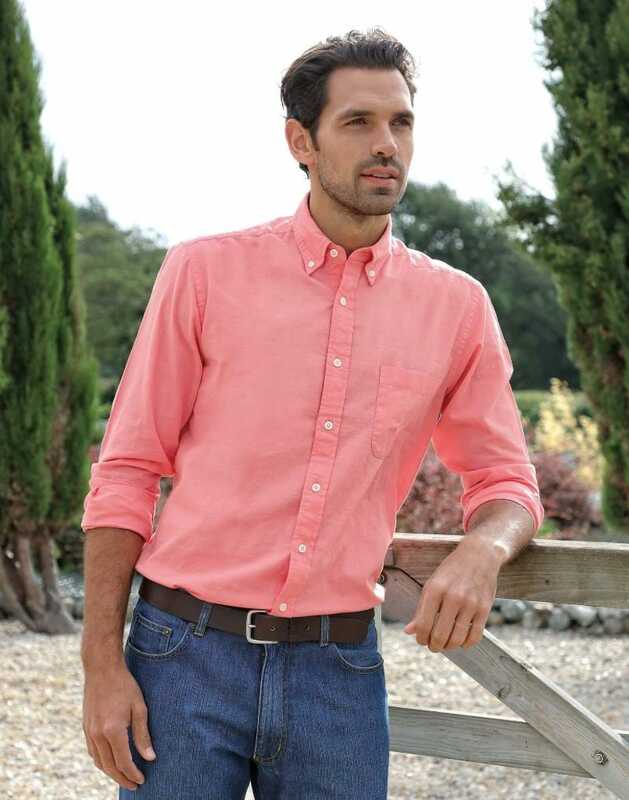 Our popular chambray shirts are available in a two denim shades and would make a great addition to any summer wardrobe. Polyester: Polyester blends are water resistant, meaning once you begin to get damp, you’ll be left feeling that way all day. Instead, go for pure cotton. Rayon: It’s easy to get caught out by Rayon as the fabric feels deceivingly light and breathable on the hanger, but as it’s a synthetic blend, it can also repel water like polyester. Denim: As previously mentioned, denim is a no-go for summer if you’re trying to keep cool. It is a heavyweight fabric which lacks breathability and stretch so is bound to make you feel overheated and sticky. The arrival of sunnier weather is a great opportunity to test out colours you’d never normally wear, whether that means reaching for a pastel men’s summer T-shirt, or injecting bright shades like yellow into your wardrobe. Each year there are plenty of fresh men’s summer outfits on the high street which you can draw inspiration from, and this year’s trends look set to include lots of bright and beautiful colours. This year, we’re set to see lots of bold reds and cobalt blues in the shops, as well as understated tones such as dusty oranges, earthy khakis and sky blues. And, according to GQ’s SS19 round-up, sage was one of the most popular shades in the fashion shows. We’re also set to see an increase in experimental trends, such as pattern clashing and military influences, which will open up more inventive colour themes for you to test out, so don’t shy away from trying these summer fashions. If chasing trends isn’t for you, you can build your summer outfits around an array of timeless shades including beige and sand tones, as well as classic whites and creams. Investing in some wardrobe staples, such as men’s summer shorts, T-shirts, trousers and jackets, in these versatile tones will ensure you have something to wear throughout the summer, no matter what the fashion is. Historically, men’s summer outfits have featured lots of softer and lighter tones, as it was thought these reflected light and heat away from the body. But, studies have shown us that you might be just as well off in dark colours like black. These deeper shades can absorb energy from your body instead of reflecting it back onto you, so you’re less likely to overheat (Nature: International Journal of Science). This opens up plenty of other versatile colour options for you to add to your summer wardrobe including navy, as well as dark greys and browns. Many men’s summer clothing lines include pastel tones of pinks, blues, greens and yellows, any of which can easily be incorporated into your outfits to add a cheerful pop of colour. They’re also surprisingly versatile, and so can be paired with a wider variety of tones and items. For example, pairing a pastel-coloured casual shirt with some beige twill shorts will have you holiday ready in no time, while a dreamy sky blue T-shirt can be paired with a men's summer linen suit for the ultimate event outfit — you can find more information on how to dress for common celebrations in our summer outfits for men: ideas for four events. While these shades might not be appropriate all year round, pastels are always a reliable feature of men’s summer fashion, so you’re bound to be making an investment when you purchase anything in these soft, elegant tones. If you’re willing to get more inventive with your men’s summer style, try picking out colours that you wouldn’t usually go for. When it’s bright outdoors, you don’t have to shy away from wearing statement colours, such as yellow and coral, as they won’t stand out as they might in duller conditions. So, if you’re new to bold colours, summer is the perfect time to try them out. To avoid overdoing it, we recommend choosing one part of your outfit to be the standout piece and keeping the rest fairly neutral. For example, try teaming one of our rugby shirts in a statement colour with a pair of our men's summer trousers or shorts for the ultimate off-duty look on cooler summer evenings. The summer makes everybody want to get together and spend more time socialising outside, so you need to ensure your wardrobe can keep up with your social calendar. From barbeques at your friends to holidays with your family, we have plenty of ideas for summer outfits for men, so you can look great through all sunny occasions. Trying to stay stylish in a hot and humid climate can be undeniably challenging, but if you plan on getting away to the beach this summer, there’s no reason why you can’t look put together while you’re relaxing. First things first, you’ll need a great pair of swim shorts that will get you noticed on even the most crowded of beaches. 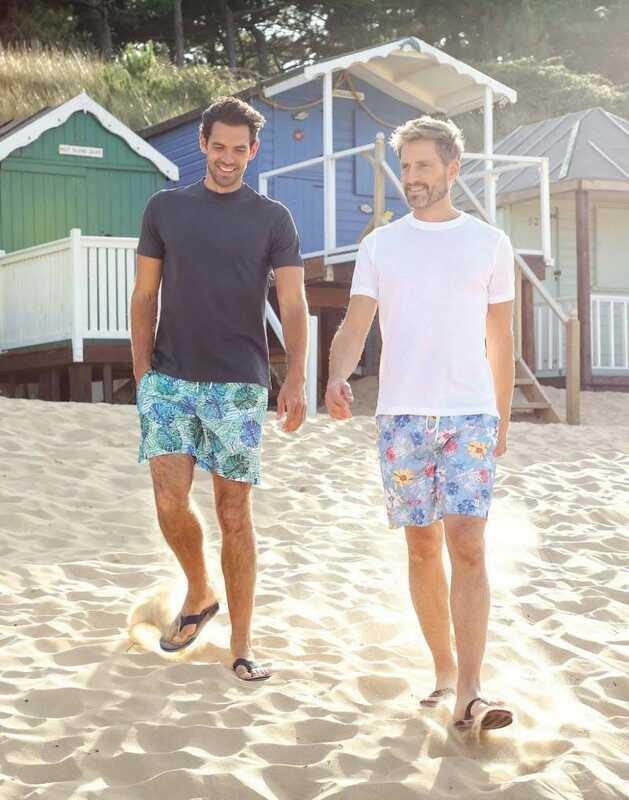 Here at Joseph Turner, our summer collection has many pairs of swim shorts to pick from, including tropical and geometric patterns with contrast stitching for a burst of bright colour. You’ll also need a cover-up for when you venture down to the local eatery for a snack. Our range of casual shirts are perfect for this, with a selection of cotton, linen and chambray designs in assorted colours. Wear these partly open with your swim shorts and a pair of men’s summer shoes, like our sandals, for the ultimate off-duty style. If you’re headed out for your lunch and want to quickly transform your beach look, we recommend teaming your casual shirt with a pair of our men’s summer twill shorts. Whether you’re choosing neutral sandy tones or military-esque khakis, the tailoring in these men’s summer shorts will ensure you look effortlessly put-together on your trip away. Plus, as they’re made of breathable summer fabric, you can guarantee they’ll keep you cool. When the sun comes out, so do the abundance of barbeque invitations. The nature of these events usually calls for a relatively casual summer outfit, but you’re still bound to want to look your best. While jeans are not off limits on cooler summer days and nights, we recommend opting for lightweight options like canvas jeans to allow some breathability — go for these in muted, lighter colours and pair with a polo shirt for impressive casual summer fashion. If you want to smarten up a bit for the occasion, try adding a men's summer jacket for a more formal look — we recommend going for something lightweight like linen or cotton to keep you cool and dry all day. 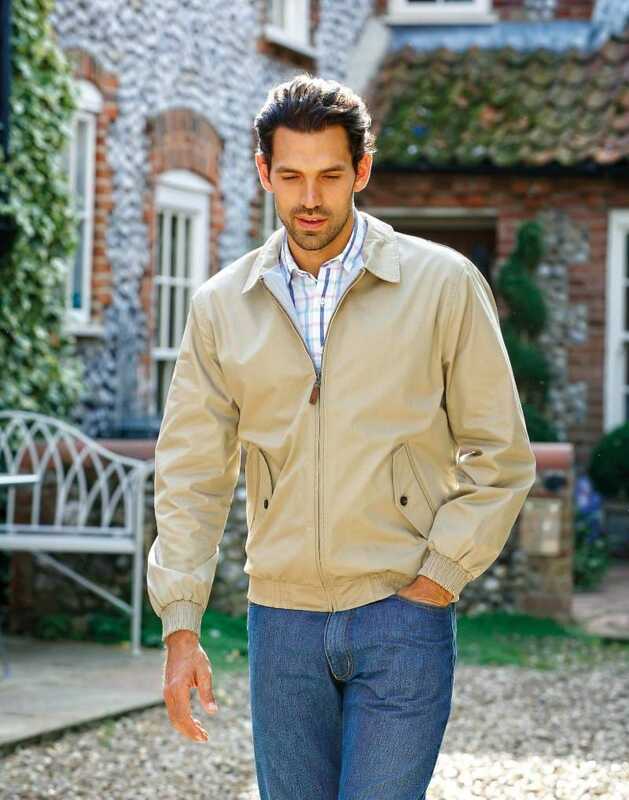 A stylish Harrington jacket in a sandy tone will ensure your outfit is neutral and will go with any men’s summer clothing, so you can throw it on when the evening breeze sets in. Alternatively, if the dress code is relatively casual, having a rugby shirt to hand will make sure you’re prepared for anything. This will add some effortless style to your look as they’re easy to throw on over any men’s summer T-shirts. It might be a good idea to get a few rugby tops in assorted colours: try having at least one neutral tone and one statement shade. Complete the look and get extra style points by adding men’s summer shoes like sandals or deck shoes. Dress codes for parties can be particularly challenging to get right, especially when they’re more formal and the heat isn’t making you feel like turning to your trusty party jacket. A fool-proof way of looking and feeling great this season is to pick smart summer shirts that are made of breathable fabrics like 100% cotton: our men’s formal shirts are crafted from the finest cotton fabrics that will keep you cool in even the warmest of weather. Men’s casual summer shirts are more experimental than any other season’s, so feel free to test out popular summer patterns like florals and paisley. Team these with a pair of smart trousers in a lightweight fabric such as cotton twill for a versatile and breathable option. Finally, finish your outfit with some sleek loafers for the ultimate gentlemanly look. Depending on the formality of the occasion, you could even wear some smart, yet relaxed linen men’s summer trousers. As this material is such a popular option for men’s summer trousers, you’re bound to be spoilt for choice when choosing a pair, whether you want to go with bright and sunny tones or neutral and versatile ones. 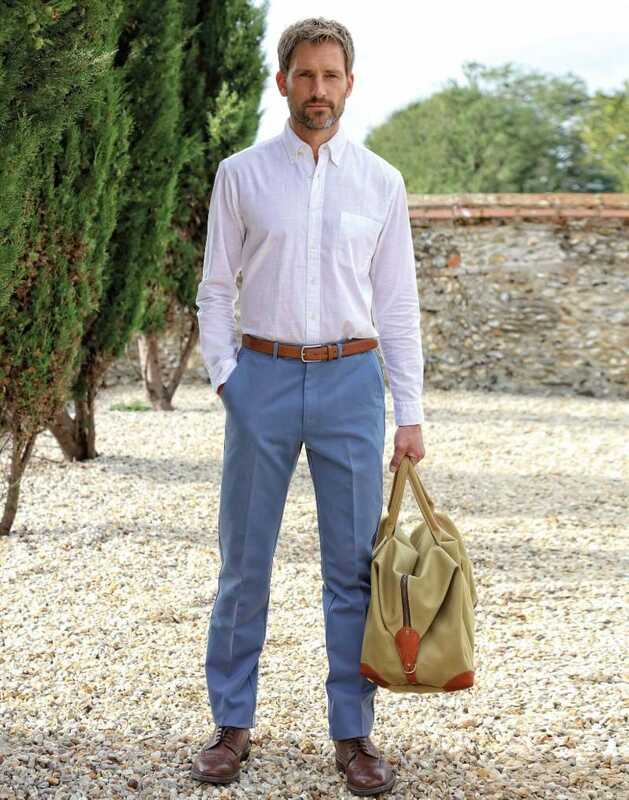 Here at Joseph Turner, we have a selection of linen suit trousers that will complete your smart-casual look — try adding some polished brogues and a matching belt in a softer leather shade like tan to create a timeless men’s summer outfit. For many couples, this season is the most idyllic and in demand time to host their wedding day. But, with outdoor ceremonies in direct line of the beaming sun and boiling hot venues, wedding attire can be one of the most difficult summer looks for men to perfect. Typically, men’s wedding suits are made of wool, with black tie dinner suits including silk or satin edging and lapels: all of which are easy to overheat in on a hot summer’s day. Investing in a great men’s summer suit will be a great idea as you can recycle this for many other seasonal events, including the races — see our guide to race attire for more inspiration. When selecting the perfect men’s summer suit, we would always recommend opting for linen or 100% cotton as the composition of these will ensure you’re cool and comfortable no matter how long the day. Our selection of linen suits are the perfect weight fabric for summer, so not only will they look great, but they’ll feel it too. While you can easily take your men’s summer jacket off when you get too hot, a smart shirt can feel equally as stuffy. When picking one to go with your summer suit, we recommend going for a lightweight, breathable cotton version such as poplin — our men’s summer shirt collection includes plenty of shirt designs and colourways in airy fabrics. For the perfect summer aesthetic, opt for a muted pastel pink or azure blue, or inject a pop of colour with a dreamy cornflower blue or coral. Finish off your look with cufflinks, a tie and some smart shoes or brogues for an undeniably put-together look. For more inspiration, be sure to check out our summer wedding outfit guide. 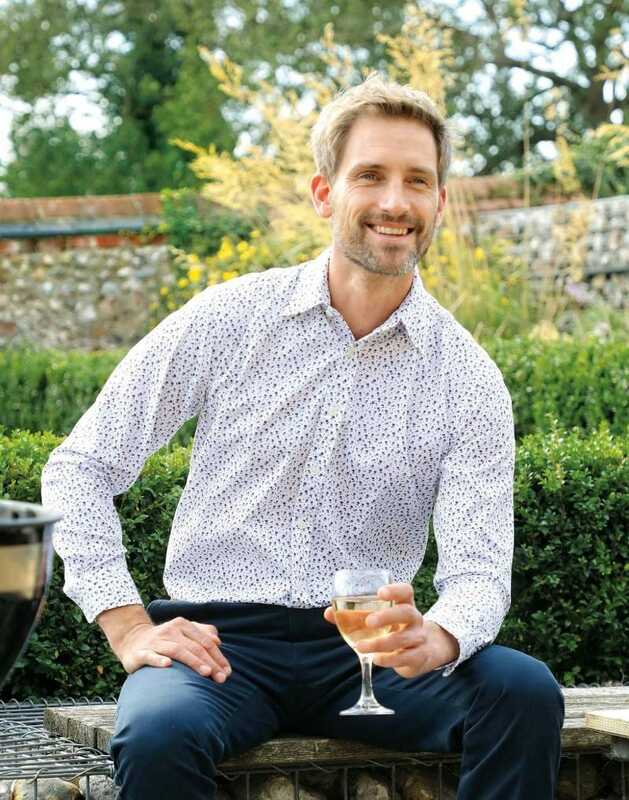 Whatever your personal style is, here at Joseph Turner, we are sure our new SS19 collection will help you nail this year’s men’s summer fashion trends. 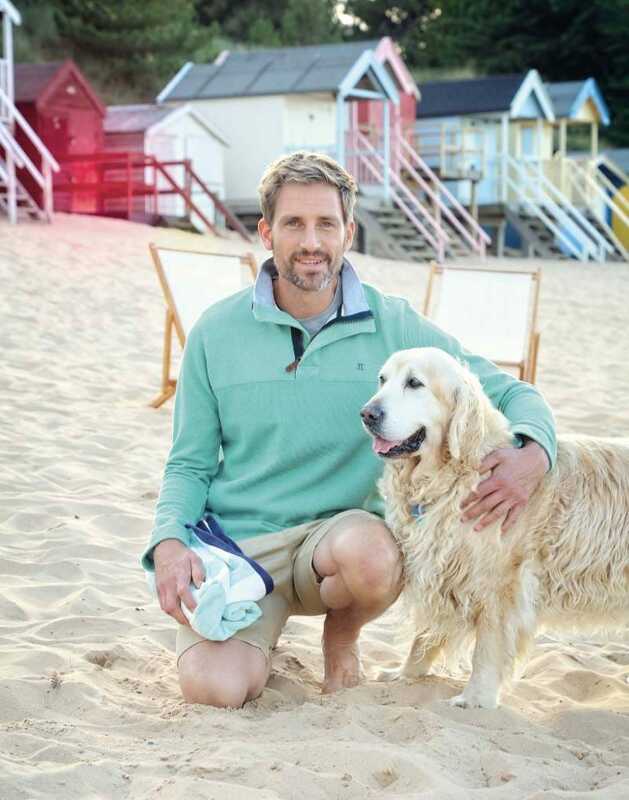 We know it can be difficult to feel and look great when the weather is hot and your clothes are thick, and that’s why everything in this range has been carefully selected to ensure it’s made of the most breathable and summer-ready fabrics. Plus, with a great range of versatile and statement summer colours, there’s something for all tastes here. Hopefully our men’s summer fashion guide has given you enough inspiration for the upcoming sunny season, but if you’d like to see more, make sure you check out our lookbook and news journal. There are men’s summer style ideas for all occasions from weddings to casual events and beach holidays, so you’re sure to look the part no matter where this summer takes you. If you have any specific questions about our men’s summer clothes, don’t hesitate to get in touch on 01845 575100 or use our contact form.